Escape the hustle and bustle of the big city when you visit Graham, a charming Texas town surrounded by the spectacular scenery of the North Texas Hill Country. Located 90 minutes west of Fort Worth, Graham is home to unique shops, one-of-a-kind restaurants, and remarkable historical sites and museums set in or near the largest downtown square in the country. Three gorgeous lakes provide a host of ways to enjoy the great outdoors, from bass fishing to kayaking past awe-inspiring limestone bluffs. Whether you’re looking to create an adventure of a lifetime or for a quiet retreat, you can set your own pace in Graham. 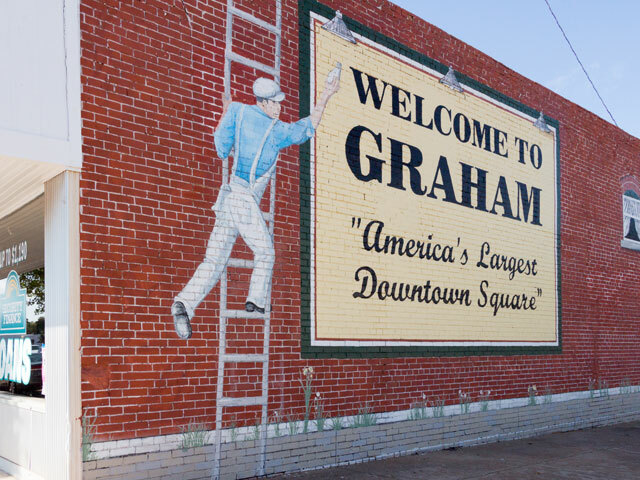 The tall tales of pioneers making new lives on untamed land, U.S. Army soldiers patrolling the frontier, and a burgeoning town founded by post-Civil War immigrants to Texas make up Graham’s rich history. All of it can be experienced firsthand when you visit the many historic sites and museums in Graham. Start at Fort Belknap, a military installation founded in 1851 that helped keep the peace between settlers and Native Americans. Then head to the downtown square to visit the Old Post Office Museum and Art Center, which showcases military equipment and uniforms, images of the town that show its culture and growth, and more. While you’re there, stop by the Courthouse Archway, all that remains of the 1884 courthouse; and the Young County Veterans Memorial, a red granite monument inscribed with the names of local residents who have served, and died, in the military. Speaking of the downtown area, how did it become the largest courthouse square in America? The square is one mile in circumference, in part because it was designed so its streets were wide enough so that wagons could turn around. Today, the square’s size gives even more space for a range of quirky boutique clothing and home goods shops, antique stores, and restaurants. Shop until you drop, then catch a flick at the historic 1919 National Theatre that still screens first-run films to this day. To partake in a different type of American film going tradition, cruise out to the Graham Drive-In Theatre, one of only a handful of outdoor movie theaters in Texas. Graham has much to offer history enthusiasts and shopaholics alike, but its abundance of parks and proximity to three lakes makes it ideal for nature lovers as well. Drive a few minutes north to reach lakes Graham and Eddleman, two North Texas fishing hotspots where catfish, crappie, white bass, and striped/hybrid bass live in abundance. Even more adventure can be had at Possum Kingdom State Park, located about 30 miles south of Graham. Explore the scenic hiking and biking trails, go for a swim in the clear blue water of Possum Kingdom Lake, or rent a canoe and paddle to the lake’s scenic coves. Along with its historical attractions, boutique shops, restaurants, parks, and recreational lakes, Graham is home to a must-do event for foodies: the Food Truck Championship of Texas. In early June, dozens of food trucks from all over the state converge on Graham to compete for a grand prize of $10,000. Let all the flavors dance off your taste buds as you walk around downtown Graham admiring art works crafted by Texas artisans. Whether you’re looking for a small-town escape or your next rugged outdoor adventure, Graham has everything you need for your next unforgettable vacation.